The researchers recommend that terms and conditions of retirement be more flexible to allow those who are willing and able to continue to work to do so after reaching official retirement age, while at the same time the safety net for the weaker groups among the older population should be improved to allow them to live with dignity. Demographic projections indicate a sharp rise in the elderly population in the State of Israel in the coming years, and it is unclear to what extent the social security and pension systems are prepared for this change. The implications of these trends and changes amongst this population are also unclear. A new study by Taub Center researchers Prof. Ayal Kimhi and Kyrill Shraberman, which will be published in the upcoming Taub Center State of the Nation Report 2013, examines these changing employment patterns, as well as the economic situation of the elderly population between the years 2000 and 2011. Research findings will be presented at a special meeting of the Knesset Economic Affairs Committee headed by MK Prof. Avishay Braverman, which will be held on October 29, 2013. In the words of Prof. Ayal Kimhi, “According to recent demographic projections, the increase in longevity is likely to bring a continuous increase in the proportion of elderly in Israel. Until 2010, the elderly dependency ratio (the number of those aged 65 and over relative to those aged 15-64) was relatively stable, and remained at a level of less than 160 elderly per 1,000 working age adults. From 2011, this ratio began to rise, and it is expected to continue to rise steadily and reach some 233 elderly per 1,000 working age adults by the year 2030.” In light of this data the Taub Center study examined whether there is a change in the ability of the elderly to sustain a reasonable standard of living for longer periods than what might have originally been planned for. 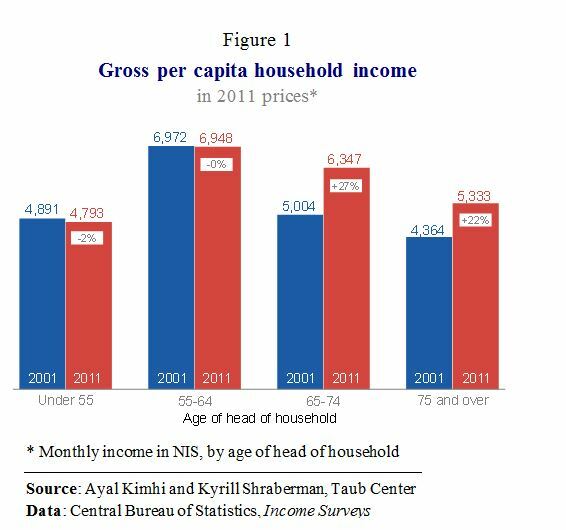 The research found that while the per capita income in households headed by working age adults (up to age 64) in Israel did not grow in real terms (that is, after accounting for inflation) in the past decade, the per capita income of households headed by older people grew significantly (Figure 1). 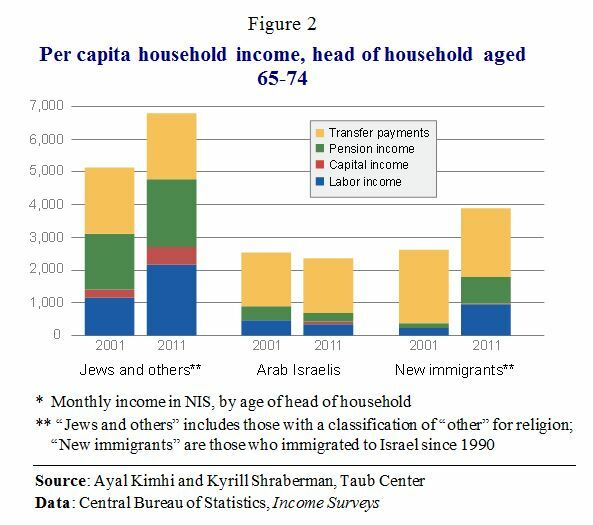 Prof. Kimhi explains this change: “Labor income contributed significantly to the per capita income increase, however elderly households benefited also from an increase in capital income and pensions.” All of this is true for the Jewish population only, as can be seen in Figure 2. The elderly Arab-Israeli population, whose per capita income was about half of that of the Jewish population at the beginning of the decade, remained behind and the gaps continued to widen. Taub Center researchers determined that the growth in income was first and foremost a result of the growth in the rate of employment of the older population. Amongst men and women in the 55-64 year-old age group (Figure 3A), the rate of employment in Israel was on the rise and was similar to the rates in the OECD countries in the first half of the previous decade. Since the middle of the previous decade, the rate of employment in Israel has risen faster than in the OECD countries and a gap of more than 6 percentage points to Israel’s advantage was created – for men and women alike. Amongst those aged 65-74 (Figure 3B), the employment rates among men in Israel were similar to those among men in the OECD countries until 2004. Beginning in the middle of the decade, employment rates rose more quickly in Israel so that by the end of the decade there was a gap of some 5 percentage points in Israel’s favor. This trend is similar to what was observed amongst the 55-64 year-olds, although employment rates of 65-74 year-olds were more than 50 percent lower than those of 55-64 year-olds. The difference is that the rise in employment rates of 55-64 year-olds has slowed down in the past few years while the rise in employment rates of 65-74 year-olds has accelerated. With regard to women aged 65-74, a different picture emerges. While their employment rate rose from about 7 percent in 2001 to more than 12 percent in 2011, their employment rates remained lower than the average of the OECD countries – although the gap narrowed beginning in 2008 to 1 percentage point in 2011. In addition, the Taub Center researchers found that one of the main factors that helps employment for the elderly is education. 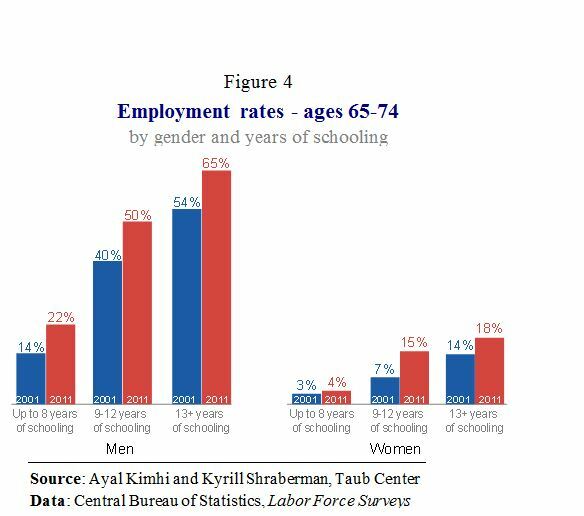 Figure 4 shows a significant gap between employment rates of those with 9-12 years of schooling and those with 8 years or less of schooling for men and women aged 65-74. Employment rates are even higher for those with 13 years of schooling or more although to a lesser degree. Between 2001 and 2011, there was an increase in the employment rates for all education groups. Amongst women, the employment rate for those with less than 8 years of schooling grew only slightly while the rate for those with 9-12 years of schooling more than doubled between 2001 and 2011. Prof. Ayal Kimhi explains: “The demographic changes that bring about a continuous increase in the number of elderly in the population raises concerns regarding society’s ability to ensure them a decent standard of living. Nevertheless, these same demographic changes, and especially the fact that the health of this group is relatively good compared to past cohorts, allows them to remain in the labor force and to sustain themselves for longer periods. Another factor that allows the elderly to remain in the work force after the official retirement age is that the job mix in the modern labor market is changing and physically demanding jobs are decreasing in importance.” One of the factors that contributes considerably to the rise in employment of the elderly and the increase in their income is their higher levels of education. Since in the coming decades an additional rise in education level of this population is expected, it is likely that the trends of greater employment and income will continue. It should not be concluded from this that the authorities do not have to take these demographic changes seriously. To this Prof. Kimhi says: “We should continue to encourage flexible employment conditions and tax breaks so as to allow the elderly to continue working even after official retirement age should they be interested in doing so. At the same time, solutions should be found for those population groups that are left behind – especially the Arab Israeli population and those with low levels of education. If it has been common to speak of three layers of income sources after retirement – social security, pension funds, and private savings – a fourth layer of growing importance, labor income, should be added. For those groups who are lacking the skills to benefit from this fourth level and who cannot enjoy labor income, the state must strengthen the bodies responsible for the well-being of the elderly – that is the social security system and pension funds.” The Taub Center for Social Policy Studies in Israel, headed by Professor Dan Ben-David, is an independent, non-partisan institution for socioeconomic research based in Jerusalem. The Center provides decision makers, as well as the public in general, with a big picture perspective on economic and social areas. The Center’s interdisciplinary Policy Programs – comprising leading academic and policy making experts – as well as the Center’s professional staff conduct research and provides policy recommendations in the key socioeconomic issues confronting the State. For details, or to arrange an interview, please contact Gal Ben Dor, The Taub Center’s Director of Marketing and Communication 054-464-2333.